Check out our selection of Budapest accommodation properties ranging from cheap hostels and serviced apartments to luxury hotels. If you travel with a group or need any assistance with your booking please do not hesitate to contact us. With its unique central location, Mercure Budapest City Center (formerly Hotel Taverna) is the perfect base from where you can discover the essence of Budapest. The newly renovated hotel is situated right in the famous pedestrian shopping street, Váci utca with its lovely shops, art galleries and cafés. Standing on the Danube bank, Danubius Hotel Gellért is one of the most popular historic hotels in Budapest with its world-famous Gellért Bath and Spa. Its impressive art nouveau building, elegant interiors and premium category services provide its guests with a full recreation in Gellért Hotel. Elite Apartments are comfortable, spacious apartments in the centre for up to 7 people. The apartments and studios are all situated in a new building, right in downtown Budapest, within walking distance to main tourist attractions, and from Vaci utca, the pedestrian shopping street, as well as clubs and shops. The mian metro station (Deák square) is only 2 minutes far. Judit Apartment Hotel has a very good location, only 2 metro sops from center of Budapest, 2 minutes walk from metro station, 5 minutes walk from Westend City Center shopping centre, the Western (Nyugati) Railway Station or the Danube. Studios include a small kitchenette with cooking facilities. Situated close to the Nyugati railway station, Leslie Apartments are within walking distance from the bank of Danube and the main public transport lines offering direct connection to the city centre and the major touristic sights. Margaret Island can easily be reached in 15 minutes on foot or by tram. In walking distance you can find several entertainment and leisure venues. For instance, one of Central Europe’s largest shopping centres, WestEnd City Centre with its cinema multiplex is just around the corner. Agape Apartment House has comfortable, new apartments in the centre of Budapest for up to 6 people. The Apartments and Studios are all situated in a new building, right in downtown Budapest, within walking distance Blaha Lujza square (metro and tram station), from here easy to reach the main tourist attractions, clubs and shops. Akácfa Apartments are good choice, if you prefer modern, ccomfortable accomodation and good location as well. The 1-3 room apartments are all situated in a new building, within walking distance from Blaha Lujza square – metro and tram station, clubs and shops. Vaci utca and Deák square (the mian metro station) only 2 metro stops. After a busy day nice to relax on he balcony and just enjoy the green garden. Centrally situated in the heart of bustling Budapest, Astra Apartments are just around the corner from the two nearby synagogues, the famous pedestrian shopping area, Váci street and the National Museum. Discover the city on foot from the fairly priced Astra apartments and have a beer in one of the nearby pubs in the evening. Central Apartments are good choice, if you are looking for stylish and modernd accomdoation in the downton of Budapest. The 1-3 room apartments are all situated in a new building, within walking distance from Deák square (main metro intersection) and Váci utca. Most sights, good restaurants and clubs are only walking distance from the apartmentes. The All-4U Apartments are situated in the heart of Budapest, in a newly built elegant building. Due to the downtown location the major sights of the city are within walking distance, including the famous pedestrian street Váci utca with popular shops and cafés, the Saint Stephen Basilica, the Chain Bridge, the Parliament, the Andrássy Avenue, the Opera House and the synagogues. Set in the very centre of the city, the modern and fully furnished Innercity Apartments are located within a few steps away from the Great Synagogue and a few minutes’ walk of the main pedestrian area and the major touristic sights. The nearest metro stations are only 300 meters away from the apartment house, allowing easy access to any point of the Hungarian capital. The City Pension Matyas can be found in the very heart of Budapest, just 100 meters away from the pedestrian quarter and the Danube bank in a neoclassical style, turn-of-the-century residential building. The Matyas Hotel is really close to the famous Váci Street with its most exclusive shops and restaurants. The listed building has 85 modern hotel rooms some of which have a fascinating panoramic Danube and Buda Castle view, providing an unforgettable stay in Budapest. Opened in 2011, Bo18 Hotel Superior is a business-friendly hotel located close to the Museum of Applied Arts and a brand new shopping mall with pedestrian area. Just within a stone’s thrown from the hotel you can hop on one of the main public transport lines (metro ’M3’, tram, bus) that allow easy access to any part of the city; downtown, touristical attractions, business areas or shopping districts. The Locust Tree Apartments are situated a 3 minutes’ walk away from the main metro line, right in the centre of Budapest. Numerous attractions are within walking distance, including the famous Andrassy Avenue, Opera House, Great Synagogue and the popular pedestrian shopping streets. Due to the perfect public transport connections you can easily reach any point of the city by tram or metro, both a few hundred meters away from the apartment house. Situated right in the city centre, Club Apartments and Rooms are within walking distance from the pedestrian shopping streets and just 100 meters from the metro station, allowing easy access to all the landmarks of Budapest. Due to its central location, from the apartment house you can comfortably reach the most beautiful sights of Budapest on foot as well. Amadeus Apartments offer centrally located apartments in Budapest with self-catering facilities and full equipment. All apartments can be found in the city centre, some of them are housed in the famous pedestrian shopping street, Váci utca, some on the elegant Andrássy Avenue and others in the vicinity of the most popular bars, pubs of the seventh district. The new apartments are housed in a recent building situated in a quiet street of the city centre, right behind the Opera House. Due to its central location you can explore the main sights of the city centre on foot, such as Saint Stephen’s Basilica, Parliament, Váci utca and the Andrássy Avenue. 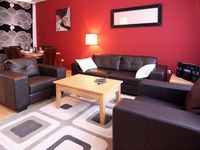 Opened in 2011, Prater Residence apartment house offers well-equipped and stylish apartments next to the Corvin Shopping Centre in a peaceful street, within five minutes walking distance from the nearest metro line that takes you to the city centre in a couple of minutes. Situated in the heart of downtown, Gozsdu Court is just a few minutes’ walk away from Saint Stephen Basilica, Opera House, Andrassy Avenue, pedestrian area and the downtown 5 star hotels. This accommodation combines unrivalled location and top-category facilities to offer an unforgettable and relaxing stay in Budapest. Set in the neighbourhood of a public transport hub, centrally located Atrium Fashion Hotel provides excellent connections to any part of the city. The city centre can be easily reached within just 10 minutes by metro or tram, while Keleti railway station and Arena Plaza shopping mall are just a stone’s throw from this boutique hotel. From Atrium Hotel you can even explore on foot the popular pubs and music clubs of the seventh district. With its unique design this four-star hotel represents a blend of ultra modern facilities and stylish interior design.